Rick Sterger started out in mobile phones, but in 2008 and 2009, the economic downturn left him laid off, in the middle of a divorce. Working as a consultant, and not sure what direction to go in, Rick had a discussion with a friend working in customs, who mentioned that you don’t have to be a lawyer on the California bar to practice immigration in the state, because immigration is handled under federal law. Rick originally had gone to law school after earning his B.A. in Liberal Arts, and holds a J.D. from the University of Minnesota Law School. So he decided to open his immigration practice. At rock bottom after the divorce and being laid off, with no budget, Rick did all his own legwork, hanging flyers and spreading the word, but had no clients yet. Referred to an attorney he had gone to school with who currently had a thriving practice in the Latin community, Rick took an offer of an office to work in and began building. Now known as “the Immigration Guy”, Rick found his niche as an attorney practicing exclusively in the area of immigration law, bringing his extensive experience in developing business systems and strategies for companies like Samsung, Motorola, Sprint, and Dell, which allows him to utilize tech systems to not only grow his business but to communicate with people all over the world, helping them work through the maze of U.S. immigration laws. Rick practices exclusively in the area of immigration law. He’s been licensed to practice law for 17 years, and is a member of the American Immigration Lawyers Association. A multi-year recipient of the California State Bar award for pro bono service, Richard has consistently dedicated a significant amount of time to assisting indigent clients in their immigration matters. His offices are situated in San Diego, California and serves clients throughout the U.S. and the world, offering state of the art online client management, information, and communication tools, which allow him to better serve his clients with their immigration needs. 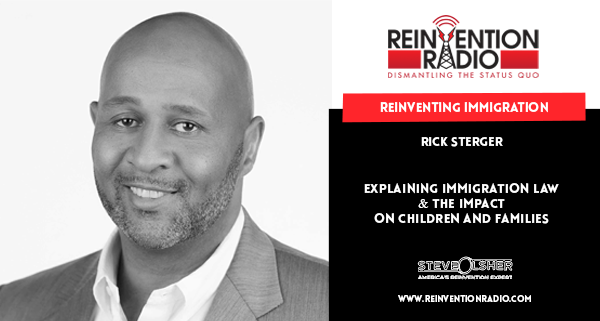 Tune in to hear Rick chat with Steve, Mary, and Richard about his journey, immigration law and the impact on children and families. What would he do about being a father? Why do people keep coming across the border? I’m out of danger but where do I settle? Do we detain kids seeking asylum with convicted felons? How do we let people into our country? Reinventing Living Fearlessly – In this episode, tune in to hear Lisa McDonald chat with Steve, Mary, and Richard about her journey from childhood abuse to where she is now – living fearlessly.